Snailspace Auction – are you going? The Snails have given joy, a splash of colour and lots of bustle to the city. Snailspace has been an overwhelming success to date and Martlets Hospice have been thrilled by the response of the public to these wonderful works of art. 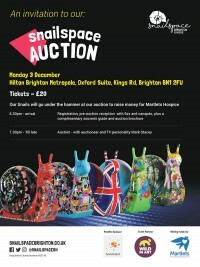 The much anticipated finale event of the Snailspace Sculpture Trail will be the grand auction. 50 incredible, unique sculptures will be up for grabs. Tickets: £20 pp which include a drink on arrival, canapes, a glossy Snailspace Souvenir Guide and auction catalogue. Mark Stacey of TV’s ‘Flog It’ and ‘Bargain Hunt’ will be your Auctioneer for the evening! 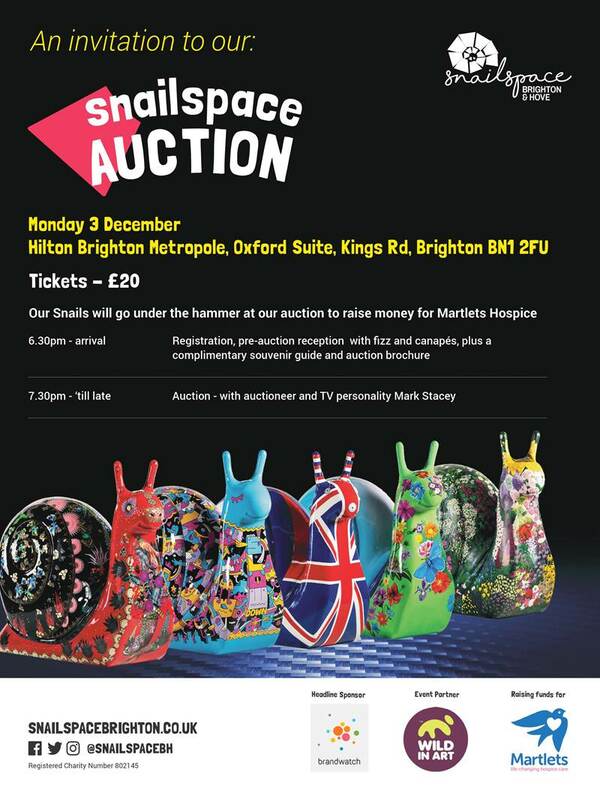 Whilst it is difficult to assess the amount that any Snail may sell for, Martlets Hospice believe that successful bids will be in excess of £4,000 based on the Snowdogs by the Sea auction in 2016. Places are limited. All profit from the auction will go to Martlets. To confirm your tickets, please RSVP to snailspaceauction@martlets.org.uk  and Carmel Da Costa will be in touch to take payment. Or you can contact Carmel directly on 01273 747455. You will receive your tickets and a registration form to complete and bring with you on the night one week prior to the event. If you are unable to make it to the auction they will have an online bidding option.